Rafael Furcal, Matt Kemp, Derek Lowe and Joe Torre talking to the media. . UPDATED ! Brewers win the wild card. They will play against the Phillies. The Dodgers will play against the Cubs. Let’s Rock ! The Dodgers will open the Division Series on the road. Either in Chicago or Philadelphia. Who do you want ? Chose your poison. If the New York Mets win the wild card, we go to Philadelphia. If the Milwaukee Brewers win the wild card, we go to Chicago. I don’t mind which team we play. If we do play in Chicago, I think luck will be on our side. 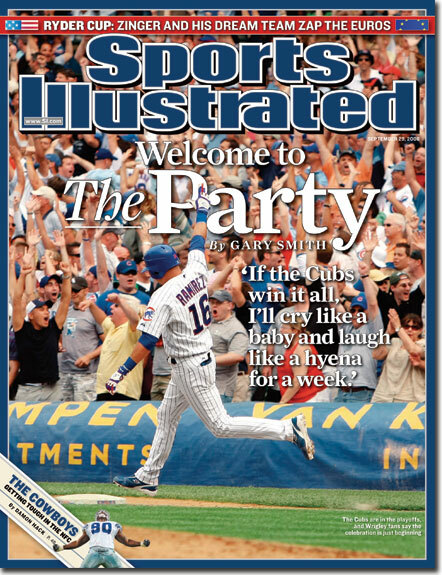 The Cubs were on this week’s Sports Illustrated Cover. That’s a curse. Some believe it on the curse. Others don’t. You judge for yourself. Joe Torre always picks a player to manage the last game of the year. This year it will be Nomar Garciaparra. That’s pretty cool. only 1 spot left. Jones has 1 year left on his contract. I would try to sign Manny for 3 years around $ 60 million. 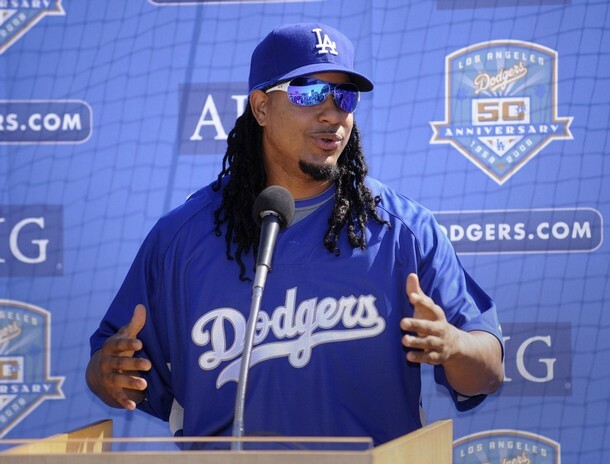 My prediction….Manny Ramirez will be playing for the New York Yankees for the next 4 years. Didn’t expect that, huh ? Yankees are mad. Manny spent his teen years in New York. For the last 8 years there have been rumors that Manny wants to play for the Yankees. Plus the way he ended his time with Boston, wouldn’t it be fun for him to play in New York ? The Yanks have the money. They will be opening a new stadium next year. It’s all set. Man-Ram is a Yankee 😦 I hope I’m wrong. In the mean time, let’s enjoy his time here and win a Championship ! The Frisco Giants still exist ? Wow, Dodgers go from a crazy celebration last night to playing a meaningless 3 game series at San Francisco. It doesn’t matter if we lose all 3 games or if we win any game, Dodgers will still be opening the playoffs on the road. Reason being that we will end up with the fewest wins among the other N.L. Teams. My advice is to take it easy. Don’t get hurt and just have fun. Get ready for next week and please….don’t get beat in the 1st round ! Remember when I posted a entry about a Juan Pierre HR Ball selling on eBay for $ 10,000 ? Well it was sold this week for only $ 150 I have no idea why you would buy this. Unless you are Jay-Z. Relax Hank. Stop worrying about the playoff system and worry about how you are going to fix your roster. You are just bitter that Joe Torre will be in the spotlight once again and you will be at home crying. Your idea of having just the top 4 teams in each league is crazy. What if the top 8 teams are in the East ? Nobody in West Coast will give a damn about the playoffs! That’s something that MLB doesn’t want and you should know that. Also, looks like you don’t remember the year of 2000 ! Yanks won the World Series. 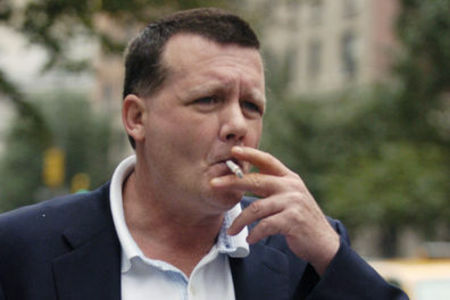 Remember Hank ? Guess who were the top 4 teams in the A.L. that year ? It was the White Sox with 95 wins, Athletics with 91 wins, Mariners with 91 wins and the Indians with 90 wins. Yankees only had 87 wins that year ! They were able to play in the post-season because they won the East division. The White Sox won the Central. A’s got the West title and the Mariners won Wild Card. Indians didn’t go to the playoffs. You forgot, huh ? So shove it! I wish we can play the Pirates everyday…. Dodgers announce the 2009 Schedule.